In 1961, television history was made. Nazi war criminal Adolf Eichmann, having been captured after 15 years of living under a false name, was captured and put on trial for his crimes. His trial was televised, the first broadcast of such nature. But who were the men behind it? BBC’s latest TV docudrama film, The Eichmann Show, aims to tell us that. Is it another strong BBC production? Or just another cheap TV movie? Directed by Paul Andrew Williams and out now on Blu-Ray and DVD comes The Eichmann Show, which has a rather uneven, rocky beginning. Straight from the get-go, we know we’re in TV movie territory. It just has that feel to it. With no opening credits and a very brief expositional sequence about Eichmann, we’re dropped right into the film with no fanfare. From this point until the trial, nothing is given any real time and anything that is given time is very rushed. I know, the trial is what the film is about and the trial is why we’re here. But I would’ve liked a bit more background. Every time any tension was introduced in the first act, it was resolved so quickly it hardly seemed worth mentioning. It felt a bit like “You’re not allowed to film this trial! WE’VE CHANGED OUR MINDS, YES YOU ARE”, as if it were being told by a bipolar storyteller! Throw in some out-of-place threats of murder, and you’ve got a rather messy first act. At this point, I cringed worried that the remainder of the film would follow the same frantic pacing and lack of development. But, once the trial arrives, so does the quality. The uncomfortable pacing slows down and settles. As we watch the trial unfold, the film-making really has a chance to shine. Archive footage of the historic trial is synced up with the newly shot backstage drama and is astoundingly well executed. Now I’m not saying this is original or revolutionary film-making – I seem to recall seeing a similar style in Oliver Stone’s JFK – but here it worked better than I’ve ever seen it before. It added a level of authenticity to the film and really made it more harrowing. There is some very hard-hitting footage of concentration camps and some deeply upsetting witness testimony, made all the more affecting by their authenticity. One man speaks through his tears of burying his wife and child, and Adolf Eichmann watches without an ounce of remorse. It’s difficult to watch. I’m not going to get deep here because it’s a powerful subject that can’t be covered lightly, but what a horrible time in history the Holocaust was. Truly and deeply distressing. I can’t imagine what it was like. But, back to the film. The cast are excellent. 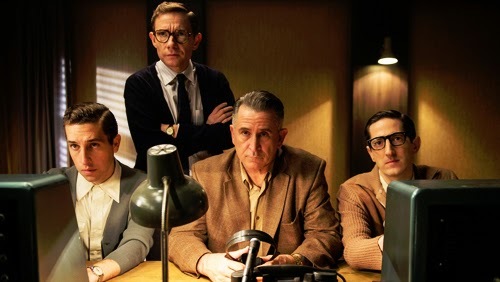 Martin Freeman, following his phenomenal performance in Fargo, continues his TV drama run with another great performance as TV producer Milton Fruchtman. But for me, it was Anthony LaPaglia who unexpectedly stole the show as Leo Hurwitz, Hollywood director called in to direct the trial for television. LaPaglia shows incredible emotion, as he struggles to come to terms with Eichmann’s lack of remorse or emotion throughout the trial. He says early in the film “I don’t believe in monsters, but I do believe men are capable of monstrous deeds”. As the film goes on, he may start to believe in monsters after all. Despite the fact the majority of the footage of Eichmann we see is real (although the actor who briefly plays him has an uncanny resemblance), the narrative really creates a villain out of this hideous man. It’s because of LaPaglia’s performance that this works so well. Also, I’m always happy to see Andy Nyman, one of my favourite character actors of today, who delivers a great little performance. As the trial goes on, age-old questions are raised once again. Can one man be tried in court for these crimes, when he was following orders? This question is in the news once again at the moment, as a 93-year old ex-Nazi may be tried for his war crimes. But is following authority and showing obedience a valid excuse? That’s a big question that one could debate for a long time, and was part of the foundation of Milgram’s iconic psychological study (which went on to inspire a Peter Gabriel song). A debate for another time and another place. My closing thoughts? The Eichmann Show is a deeply affecting production which adds to BBC’s run of increasingly impressive films. Part documentary/part drama, the film serves as a highly informative piece of work giving exposure to a rarely covered piece of television and courtroom history. Whilst the pre-trial part of the film is ridiculously rushed (I feel it could’ve easily been bulked up to a 2 hour run-time), you’re here to watch the trial and that is where The Eichmann Show really excels. The world should not forget the atrocities that happened in those dark years. My verdict on The Eichmann Show? 4/5, your honour.